My recommendations this week are as diverse as jazz, from post bop piano trio to Afro-Cuban firestorms to guitar wizardry and youthful exuberance. Never dull on the Twin Cities jazz scene! Although it may sport the area’s worst sound system, the little music corner inside Crave at The Galleria (Edina) also hosts some of the area’s top chamber musicians and vocalists. The “house band” generally features Laura Caviani and friends, and tonight (Friday the 13th—good luck in music!) the friends include seldom-heard bassist Kevin Clement, drummer Phil Hey, and birthday girl vocalist Lucia Newell. Clement flies planes for Northwest so his gigs are infrequent but he is well worth seeking out. The ambient chatter should dissipate by 10 pm or so and the kitchen makes the wait worthwhile. One of the area’s most intriguing small bands, Fat Kid Wednesdays, does a double play tonight (3/13), opening at the Dakota for Haley Bonar and then running crosstown for the evening show at Café Maude at 54th and Penn in south Minneapolis. This little haven of experimental music and great bar food can be crowded and noisy, but the music is among the most exciting in town. FKW is case in point with Michael Lewis, Adam Linz and JT Bates. Each deserves his own star on the Twin Cities Jazz Walk of Fame. Dean Magraw already fronts two of the most exciting guitar trios in town—his own trio and Red Planet. Now he’s come up with another configuration dubbed Impulso, featuring RP cohort Jay Epstein on drums and Atlantis Quartet saxophonist Brandon Wozniak. Sparks will fly at the Artists Quarter, March 13-14. And on Saturday night, start off at the Dakota and help the Twin Cities’ most swinging couple, Ginger and Bobby Commodore, celebrate their March birthdays with their annual bash. Just be careful if you’re holding a wine glass when Ginger hits her high notes---I’m sure she can shatter glass. But it will be a lovely explosion. 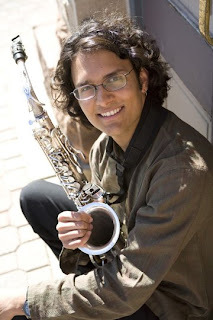 Two worthy events within about 100 feet of each other on Sunday night (3/15): At Brit’s Pub (upstairs in the Clubhouse), guitar guru Paul Renz teams up with Berklee College classmate, flautist Anders Bostrom, and his usual bandmates for an evening of “beyond bop.” They’ll be chilling out after a duo recording session. Meanwhile, across the street at Orchestra Hall, Nachito Herrera is back in town with Juan deMarcos and the Afro Cuban All-Stars. The band has been touring out west and through the Midwest for the past month following a week of rehearsals at MacPhail, and head east after tonight’s gig to finish the tour in New York and New England. I had an opportunity to sit in on a couple rehearsals and this is one of the most exciting, talented ensembles of Afro-Cuban music you will hear. Many of the musicians are alums of the famed Buena Vista Social Club and its offshoots. And we already know what a volcanic pianist we have in Nachito. Dancing shoes are highly recommended. Looking for something a little different for St. Patrick’s Day? You can get green beer and Irish jigs in St. Paul but instead catch singers Dorothy Doring and Donald Thomas at the Dakota. It might not feel like Dublin but you’ll hear some great standards and blues from two very satisfying voices. Good chance Jack Riebel will have something besides blarney on the menu. 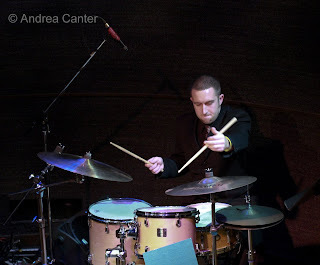 Young Reid Kennedy, one of the most exciting of a new crop of drummers, has assembled a radiant trio with pianist Chris Lomheim and bassist Graydon Peterson, and on Wednesday night (3/18) they celebrate their debut recording, Reflections, at the AQ. Entirely original compositions from Kennedy and Peterson, the CD is a remarkably mature and elegant feast. Enjoy it live. And speaking of young, youth rules during an early set at the AQ on Thursday (3/19) when The Alternates grab the stage. These guys are still in high school but their sound, their creativity are years beyond. They made quite an impression at their debut gig in January, and return now and again next month (4/16). Jazz is alive and well. 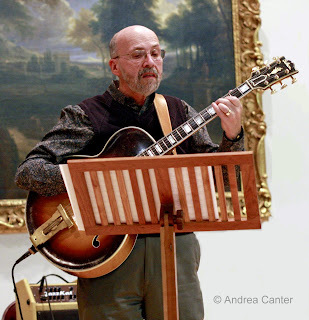 And well into the night—enjoy a set with the Dave Karr Quartet at 9 pm and then head out to the Red Sea for a late set with Pooches’ Playhouse, featuring guitar star Joel Shapira, bassist Pooch Heine and friends. Plan to sleep in on Friday. And if you need a break from jazz, or just like to keep your ears open, Yo Yo Ma returns to Orchestra Hall with his Silk Road Project on Monday (3/16). It’s not bop, but it is transcendent. What’s coming up? The great “Bon Vivants” trio with Anthony Cox, Chris Lomheim and Phil Hey at the AQ (March 20-21); Denver-based saxophonist Akash Mittal at the Dakota late night on March 21st; Tanner Taylor’s Tribute to Oscar Peterson at the Bloomington Center for the Arts (March 22); vocalist nonpareil Tierney Sutton at the Dakota (March 25-26). Don’t forget there’s great pizza and song nearly every Monday and Wednesday nights at Fireside Pizza in Richfield, with Charmin Michelle and Denny Malmberg. No cover and extra cheese. 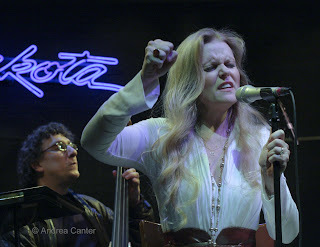 I am quite certain I could not survive the life of a jazz musician, and this is based solely on my state of exhaustion following six consecutive nights at the Dakota Jazz Club in Minneapolis in the audience, not on stage. Even for me, I think that was a record. The waitstaff offered me overnight accommodations. And at least for the past week, I suspect there were enough nightly patrons to create our own jazz dorm. But really, all this jazz has me a bit worn out. And happily so, although I am somewhat relieved to stay home this evening and bask in the glow of jazz nights past. 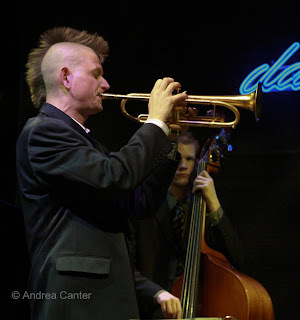 The delights of the past week were not only in hearing some of the most talented musicians on the national (and local) scene back to back to back, but seeing a jazz club filled, even to the point of standing room only. Dakota owner Lowell Pickett advised us each night that the best way to counter the recession was to go out and hear live music. Apparently that advice was taken to heart and ear, at least on Nicollet Mall. So what did I hear? 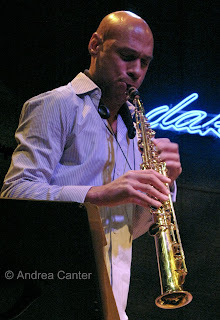 March 2­–3, The Joshua Redman Trio. Now that he is over 40, the winner of the 1991 Thelonious Monk Saxophone Competition is not so much a “young lion” as a mature monster, as composer, performer and bandleader. 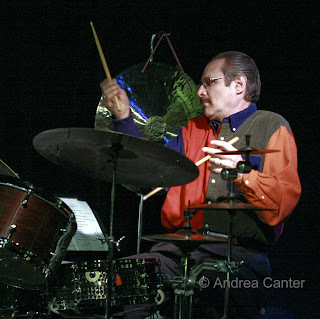 He steered the mythic SF Jazz Collective through its first few years while continuing to build his improvisational chops and character as one of the 21st centuries most engaging writers. Touring with equally impressive if lesser known bassist Reuben Rogers and drummer Gregory Hutchinson, over four sets Redman treated us to swinging interpretations of “The Surrey With the Fringe on Top,” gorgeous balladry on “My Foolish Heart,” and a sheaf of original tunes (e.g., “Insomnomaniac”) that soared far above the modal exercises of much of the contemporary saxophone repertoire. As on his new CD, Compass. March 5, Esperanza Spalding. Esperanza is young enough to be dubbed a “Young Lioness” but that hardly seems sufficient. At 24, the bassist/vocalist is already a veteran performer and faculty instructor at Berklee; her resume includes the talk show circuit and a performance at Obama’s inauguration; her second recording (Esperanza) was on many “best of” lists for 2008. And of all the gigs at the Dakota this week—maybe of all 2009 gigs so far—Esperanza not only sold out the tables and barstools, she sold out what standing room tickets were available. For both sets. Top that off with a show that crackled with energy from the first note, with a stage presence that easily matches or surpasses any veteran, and with a downright excess of musical talent. 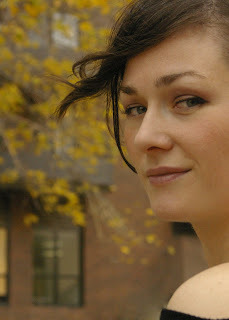 Vocally she has a mature approach to phrasing and a dare-devil sense of interpretation, capped with bits of Mina Agossi’s elasticity, in three languages (English, Spanish and Portuguese); her bass playing (on acoustic or electric) smacks of the dexterity of a Christian McBride and the power of a Stanley Clarke. Watching her is nearly as exhausting as it is fascinating, as she sways and twists as if body English alone could extract the notes. Maybe it can. Her young cohorts were nearly as impressive, particularly pianist Leo Genovese, and her encore duet with drummer Otis Brown III (playing just snare on the front edge of the stage) was sheer delight. March 6, Debbie Duncan/Late Night Jam. Honestly I only caught the final 20 minutes of Debbie’s last set and the opening notes of the Bryan Nichols Trio’s late jam, having walked over to the Dakota from Orchestra Hall after an evening with the Jazz at Lincoln Center Orchestra (see March 7th blog). Debbie ran well beyond the usual 11 pm stopping time and no one minded; every moment with Debbie is time well invested. It was clear that there would be a sparkling jam session as most of the JALC musicians began filtering in, instrument cases in hand. They weren’t just there for the menu. I planned to return the next night so opted out of one more late evening. 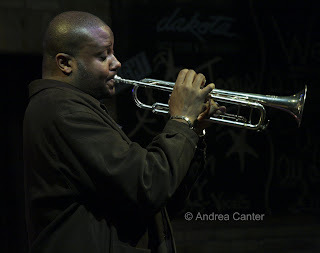 I hear I missed some ferocious playing from trumpeter Sean Jones, among others. 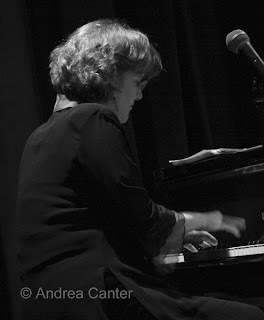 March 7, Kenny Werner Trio with Debbie Duncan. For years, Kenny Werner has been one of my favorite pianists, someone whose exquisite touch and inventive mind yield diverse interpretations and compositions that define post bop elegance. 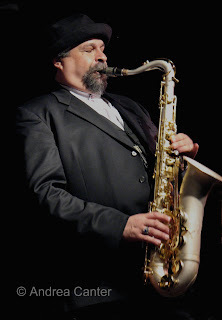 Although recording and touring most often in trio format, he’s also a long-time partner of harmonicist Toots Thielmans and Broadway star Betty Buckley, and has led some highly effective quintet and sextet projects. He is currently touring with a new trio of youngbloods—Jorge Roeder on bass and Richie Barshay on drums. Despite their youth, or perhaps because of it, Werner’s partners offer the perfect complement to the master’s music---if Werner himself took up bass or drums, he would be Roeder or Barshay. One of Werner’s trademarks is his use of pianissimo and open spaces, two traits his cohorts shared with patient reverence. 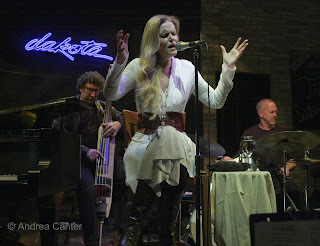 As did the audience, the most attentive Saturday night crowd I have ever experienced at the Dakota. Among a bagful of gems were Werner’s interpretation of Bach’s “Sicilienne” (my personal favorite of Werner’s book), Horace Silver’s “Peace” and Kenny’s “Beauty Secrets.” But the two sets were not limited to the Kenny Werner Trio. 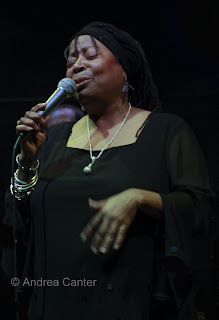 Vocalist Debbie Duncan (whose Saturday night gig was bumped when Werner was available for just one night) joined the ensemble for two tunes each set, and as marvelous as she is on any given night, she was simple stunning with Werner, particularly in rendering Jon Hendricks lyrics on “‘Round Midnight.” Werner seemed well aware that this local musician was of national caliber. March 7, Late Night Jam. This time, there was no leaving. As the Kenny Werner Trio packed up, Bryan Nichols, Adam Linz and JT Bates assembled on stage, the anticipation electric. If no one showed up to jam tonight, we would nevertheless be treated to insanely powerful and provocative music from these musicians. The trio began. Then Wynton Marsalis was on stage. Not just for the obligatory tune―he returned later with a JACL quartet, with pianist Dan Nimmer, bassist Carlos Henriquez and drummer Ali Jackson. Freddie Hendrix, young trumpeter with JALC, joined the fun with Nichols and company, and local trumpeter Dave Thomas and what I assume to be two of his students put on a fiery display of brass. Nichols, Linz and Bates were in top form, yielding only after a short break to the core of the JALC. Hearing Wynton in a club setting is ample proof that he deserves his lofty ratings as one of the top trumpeters of any generation. And his sense of humor and on-the-spot invention was on display as well, as he commandeered an empty cocktail glass to serve as an effective mute. I thought we stayed til the final note, only to learn later that local thunderbolts Mike Lewis (Happy Apple’s saxman) and Kevin Washington (drummer nonpareil) spent another ten minutes with Wynton before the lights went out. I’m sure they blew the house down. So excuse me while I spend an evening at home with my cat. With a smile on my face and a glow in my ear. This winter marks the 50th anniversary of one of the legendary concerts of jazz—Thelonious Monk’s Town Hall concert, performed with a ten-piece band—Monk’s first big band performance. 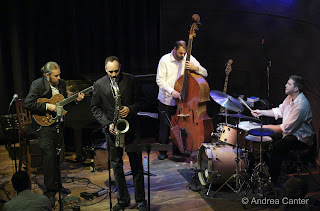 Last week, two concerts at Town Hall, February 26-27, celebrated the original Town Hall gig, the first as a reenactment of sorts featuring the Charles Tolliver Trio, Quartet and Tentet, the second a more interpretative, mixed media presentation led by Jason Moran with his “Big Bandwagon” octet. Last night in Minneapolis we got our own celebration of Monk with the Jazz at Lincoln Center Orchestra. For an encore, Wynton returned to the stage with just a sextet—trumpet, sax, trombone and rhythm section. They ran through “Green Chimneys”—bumps and angles and blemishes in full view. It was Monkish. It was glorious. So what was the outcome at Town Hall last week? You can get a taste of the result from an eight-minute studio video of Jason Moran’s ensembe at http://www.wnyc.org/shows/lopate/episodes/2009/02/25/segments/124763. Relative to the (larger) JALC effort, Morans’ arrangements preserve more space, the piano more dominant. From reviews, Tolliver’s varying combinations (from trio to full tentet) offered the most authentic recapitulation of the original Town Hall concert, while Moran’s octet (including tuba) offered less angular, more “hallucinogenic” and impressionistic interpretations (see Will Friedwald’s review in the Wall Street Journal, March 4, 2009). 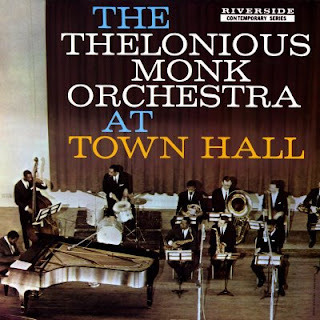 Both Town Hall concerts probably appealed most to those already enthralled with Monk as well as modern post bop. We’ll get to see/hear the multi-media event on May 9th when Jason Moran brings the Big Bandwagon and “In My Mind: Monk at Town Hall” to the Walker Art Center. I figure I am behind enough for this week that I should just keep looking ahead! There is one more night of pure postbop bliss at the Dakota with the Joshua Redman Trio. The opening sets last night featured some of the most inventive and musically satisfying sax to grace the club stage in recent years, as Redman has only grown in artistry as both performer and composer. The young lion is now a mature musician who trades bravura virtuosity for confident risk-taking, while also opening wide spaces for his talented cohorts, bassist Reuben Rogers and drummer Gregory Hutchinson. Their shouts of mutual admiration and big grins throughout the set tell it all. Last sets tonight at 7 and 9:30 pm (March 3rd). The Dakota is having a blockbuster week. 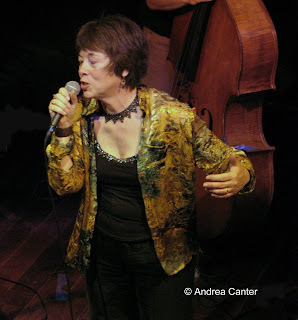 Wednesday night is the return of Claudia Schmidt, the folkie-turned-jazzer who recorded live with the Dean Magraw Quintet three years ago and will reunite with the dazzling guitarist and mostly the same ensemble, with Brandon Wozniak replacing the touring Mike Lewis. 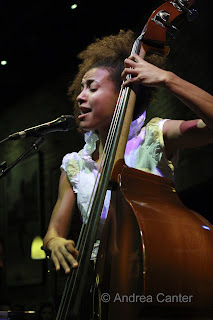 Stick around for young bass/vocal sensation Esperanza Spalding on Thursday night. 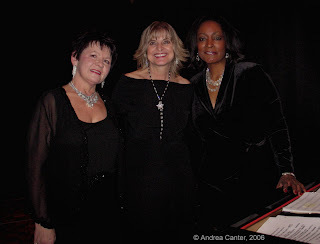 I caught her with an equally youthful trio at the Detroit Jazz Festival last September. Easy to see why her alma mater Berklee wasted no time in giving her a faculty appointment. Cap off the weekend with a rare evening in the lyrical arms of pianist Kenny Werner and his trio, at the Dakota for an unusual Saturday night gig. (Unusual for the Dakota—this isn’t party music!) Werner is a longtime personal favorite who has not made the Twin Cities scene in a long time, but has been releasing recordings in varying configurations from instrumental sextets to big bands to duets with Roseanna Vitro. His affinity for singers will be on display Saturday night when he welcomes guest vocalist and local icon Debbie Duncan. Keep your table warm at the Dakota, the SF Jazz Collective returns with a tribute to the compositions of McCoy Tyner on March 10th. 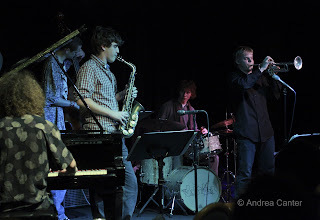 Just one night, two shows, seven of the most productive and creative jazz musicians on earth sharing the stage. 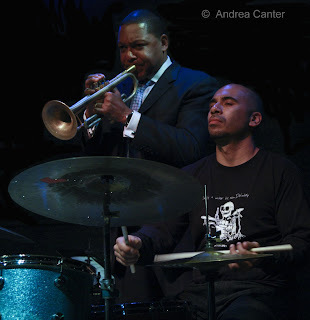 (Normally the SFC is an octet—vibraphonist Stefon Harris is on a one-year leave.) New leader Joe Lovano has not been heard here in a few years; in the interim he has released some dazzling duets with Hank Jones as well as one of my favorite recordings of 2008, Symphonica with the WDR Big Band. The rest of the band can readily hold their own on any stage—Dave Douglas, Robin Eubanks, Miguel Zenon, Renee Rosnes, Matt Penman, Eric Harland. Good sounds come from the Artists Quarter this weekend—young guitar stud Cory Wong on Friday (3/6) and noted pianist/composer Laura Caviani on Saturday (3/7). The Jazz at Lincoln Center Orchestra, led by Wynton Marsalis and featuring 14 more of New York’s finest, will do a two-day residency this weekend, starting with a day of high school band clinics on Friday, a free family concert on Saturday afternoon, and back to back evening concerts at Orchestra Hall. Friday night they focus on Thelonious Monk—which might seem like a conceptual stretch for Marsalis, but he IS a student of jazz history and Monk is certainly one of history’s most colorful figures. Saturday night will be a more varied program highlighting the JALC’s soloists. Not enough choices for the weekend? It’s really too much—for free and unforgettable, you have two nights to hear one of the most creative of modern pianists, Frank Kimbrough, in trio (with Gordy Johnson and Phil Hey) on Friday night (3/6) as part of the U of M Jazz Fest weekend, and with Jazz Ensemble I on Saturday night (3/7). Seriously, I am planning to be cloned. 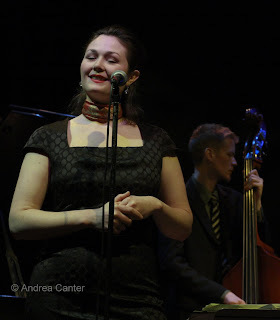 More casually speaking, chanteuse Vicky Mountain joins swing guitarist Reuben Ristrom for some exquisite brunch fare at Trygs on Sunday (3/8, 11 am – 3 pm) and you can usually wash down your pizza with beer and Charmin Michelle at Fireside Pizza in Richfield every Monday and Wednesday night. Looking ahead? Dean Magraw has a new trio project, Impulso, with Jay Epstein and Brandon Wozniak, debuting at the AQ on March 13-14; Fat Kid Wednesdays open for Haley Bonar at the Dakota on March 13th; the Reid Kennedy Trio celebrates the release of their sublime CD at the AQ on March 18th; and the AQ also presents one of the most energetic young bands in the region when The Alternates take the stage for the early show on March 19th. 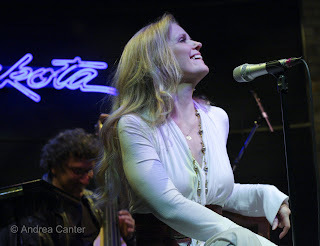 Photos: (Top), Joshua Redman at the Dakota on March 2nd; Claudia Schmidt recorded live at the Dakota in 2006; Joe Lovano returns with the SF Jazz Collective. Photos by Andrea Canter.